The 715-acre Baker Sanctuary provides mature hardwood-juniper woodland habitat for the Golden-cheeked Warbler, an endangered songbird. Baker Sanctuary is open to Travis Audubon members and their guests. The Jackie Arnold Education Center provides space for classes and meetings. The historic Baker cabin is in the sanctuary, as is the Baker family cemetery. A trail system is marked for hikers and birders. The Golden-cheeked Warbler (GCWA) is a migratory bird that nests only in 29 counties in Central Texas. The males arrive around mid-March and begin establishing territories. The warblers need the Ashe juniper bark that strips easily for nest material and the insects that live in the canopy of oak trees and other hardwoods for food. The females arrive around the end of March, and egg laying begins in early April. By the end of July, the warblers fly to the mountainous areas of southern Mexico and to east-central Guatemala, Honduras, and Nicaragua. The main cause for the decline in the GCWA is the loss of breeding and nesting habitat. Other causes of warbler decline are breeding habitat degradation caused by grazing and range improvement, construction of dams that flood the breeding habitat, oak wilt, parasitism of nests by Brown-headed Cowbirds, fragmentation of breeding habitat, and the lack of hardwood recruitment into the woodland canopy due to overbrowsing by White-tailed Deer. The GCWA was federally listed as an endangered species in 1990 and was added to the Texas Parks & Wildlife Department’s list of endangered species in 1991. 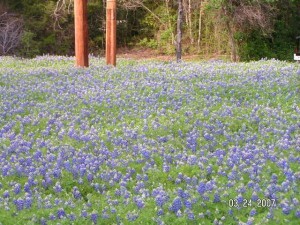 Because of its endangered status, the GCWA was among several plant and animal species included for protection under a regional habitat conservation plan called the Balcones Canyonlands Conservation Plan (BCCP). The primary goal of this plan is to assemble and manage over 30,000 acres in northwestern Travis County, called the Balcones Canyonlands Preserve (BCP) system, to protect viable populations for the species addressed in the plan. The Travis Audubon has committed its Baker Sanctuary to the BCP system and is one of several managing partners in the BCP. 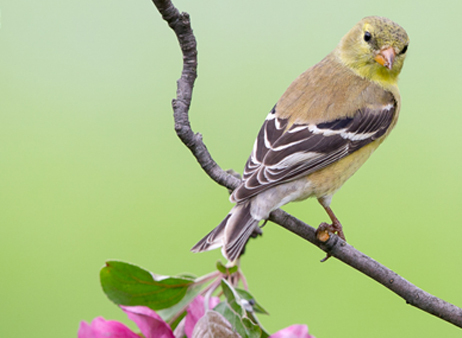 The Sanctuary uses a U. S. Fish and Wildlife-approved management plan that specifies activities aimed at ensuring the continued survival of the Golden-cheeked Warbler. Travis Audubon was organized in the 1950s and its members were among the first to recognize that the Golden-cheeked Warbler’s habitat was disappearing through urban development. Travis Audubon members searched for suitable land to begin a sanctuary and in 1966 purchased 94 acres. In 1972, Chell Baker, who owned land adjacent to the original 94-acre sanctuary, deeded his 536 acres to the Travis Audubon with a life estate for himself, his sister and a friend of his. 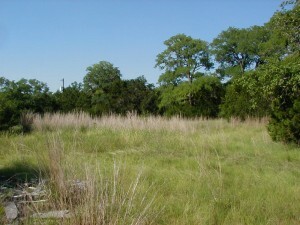 The third acquisition of land came in 1987 when Nelma Gholson and Carolyn Chamberlain donated 50 acres to the Travis Audubon in memory of Grover Hatfield, Jr. In March of 2007, Travis Audubon acquired 9.83 acres adjacent to the parking lot on the original 94-acre sanctuary from Ruth Fredericksen. *PLEASE NOTE: Dogs and mountain bikes are not allowed at Baker Sanctuary, as they disturb nesting birds. 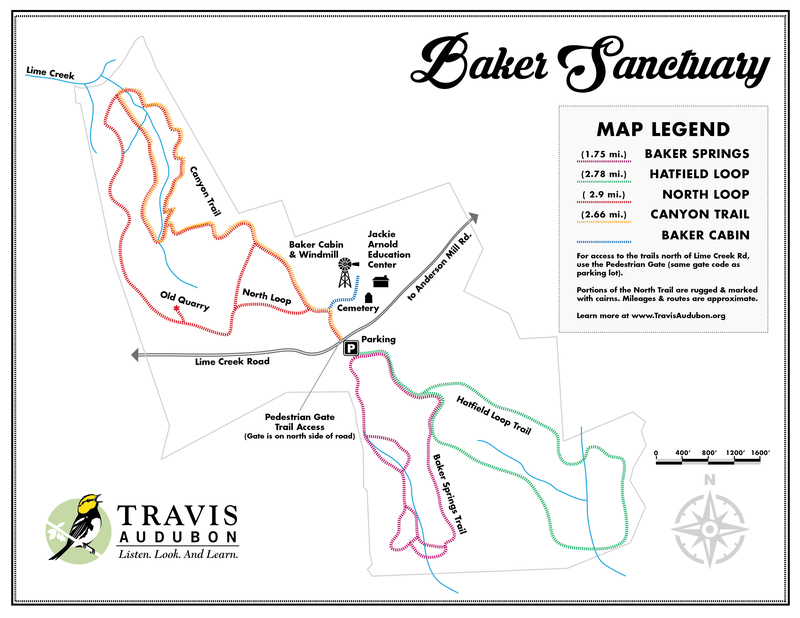 Print the Baker Sanctuary trail map here!